For many photographers, the first time they shoot with a telephoto focal length of 300mm or longer they discover an entirely new world of images to capture. For sports and wildlife, especially bird, photography, a telephoto lens allows you to fill the frame with great sports action and sharp details of animals and their behaviors. As with so many questions in life—and photography—the answer isn’t straightforward. If image quality is paramount, then a longer lens will deliver sharper images than a telephoto with a teleconverter. If your wildlife images were to be printed in a nature publication, a coffee-table-sized book or in large sizes for framed display, then you want the right telephoto lens, not one with a teleconverter. If you’re a hobbyist or enthusiast who is primarily sharing your telephoto images with family and friends and/or uploading them to a Website, then any loss of image quality due to the use of a teleconverter will be negligible and of no concern. According to these two examples, the dividing line between buying a new lens or a teleconverter is generally the same that separates the professional photographer from the enthusiast. Price is a primary factor, considering the new Nikon 800mm costs more than $17,000! Even half of that focal length, as represented by the Nikon AF-S 400mm f/2.8G lens, costs $9,500. Only professional photographers—and very successful ones—could afford and justify that level of investment. Another factor that must be taken into consideration when answering the question above is the weight of a lens with additional focal length. Although an extreme example, that new Nikon 800mm weighs 10 lbs. The Nikon AF-S 600mm f/4G telephoto lens weighs more than 10 lbs. and costs more than $10,000. Which makes the most sense for most photographers: Carry an 10-pound 600mm lens you might use in addition to a smaller telephoto, or the Nikon AF-S 300mm f/4D IF-ED lens that weighs a bit more than 3.0 lbs. with a teleconverter attached that only weighs ounces? You must be shooting some very serious photography and being paid plenty for it before you’d want to carry all those weighty lenses into the wilderness. For the great majority of photographers, a teleconverter paired with a smaller, and more affordable, telephoto is certainly the best choice. The following tips should help you when you are ready to buy a teleconverter. Nikon teleconverters have strong brand recognition in the marketplace, offering 1.4x, 1.7x and 2.0x models. There is also a new 1.25 teleconverter specifically made for the new 800mm lens, which extends its focal length to 1,000mm. Although a teleconverter gives you more focal length, it also narrows the aperture of the lens by 1, 1.5 or 2 stops. The 1.4x teleconverter, for example, “converts” a 2.8 lens to f/4. This is important to keep in mind if you are buying a telephoto lens and a compatible teleconverter together. If you can afford it, then your best combination is the fastest telephoto lens and a teleconverter. Choosing the 2x teleconverter may not be your best option, especially if don’t have the fastest telephoto lens. The 2x reduces the amount of light entering the camera more than all other Nikon teleconverters and some photographers report that the 1.4x and 1.7x models are sharper. A 1.7x teleconverter on a fast 300mm lens results in 510mm, which should be plenty of focal length for most amateurs. As we often recommend at PhotographyTalk, the best first step is to rent a telephoto and converter first, maybe a couple of different models and combinations, to determine if you like the results. You’ll also know that you are spending your money for equipment that matches your photography goals specifically. 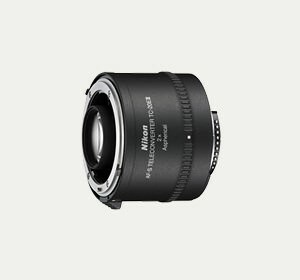 The Nikon TC-14E (1.4x) AF-S Teleconverter is available from Amazon for $499.95. The Nikon TC-17E II (1.7x) AF-S Teleconverter is available from Amazon for $530.33. The Nikon TC-20E III (2.0x) AF-S Teleconverter is available from Amazon for $439.00.